If you buy a PC, what’s it worth in a year? 70% of what you paid for it? Maybe. How about in two years? 40%? Ok, how much is it worth in five years? $50? Things change when you buy a Mac. You see, after a couple of years you can always head over to eBay and recover some of your initial investment. But to give you an idea of just how much you can get for your old machine, I checked out some prices on eBay and found some interesting things. Imagine if each year, for the past six years, you bought one of Apple’s 15” pro laptops. And now finally you want to sell them all; what could you get for them? How much value does your machine hold over time? This very subject became quite important to me a week or so ago when I finally decided to sell my old PowerBook. And let me just say, the results were pleasantly surprising. For comparison purposes I tracked the price of a 15” MacBook Pro (and then a 15” PowerBook). 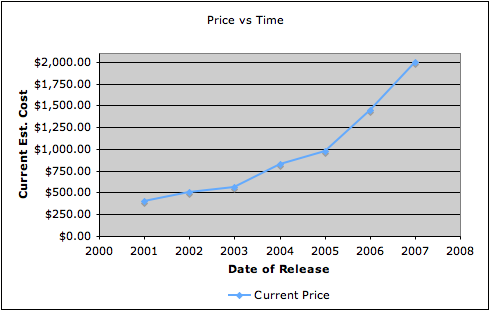 The graph below shows the current going rate (on eBay) for Apple’s pro 15” laptop for each year for the last six years. 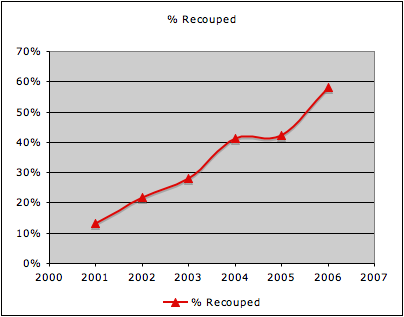 Now, if you look closely at the graph you will see a very surprising trend. A new machine currently costs $2,000, while a year-old machine sells (on eBay, mind you) for around $1,500, and a two-year one for about $1,000. At this point, one would expect things to go downhill from there fairly rapidly (much like in the PC world). After all, prior to 2005, all the laptops were using the now-obsolete G4 chips which should make them worth even less. But instead, prices seem to level off a bit which means you can (and, in fact, I just did) sell a six-year-old laptop for close to $400. This is even more impressive when you realize that you can buy a brand new laptop from Dell, Acer, Toshiba, and the like starting around $600. Here is another graph which shows the ratio of current price to original price. This gives you an idea of how much you can expect to get back from your original purchase (assuming, of course, that you bought it brand new in the year it was released). These numbers can be interpreted in two different ways. The first way is to look at these prices and assume that because Apple faces no hardware competition, prices stay artificially high. And I think this is a fair way to view the current market for used Apple products. However, the second approach is to realize that Apple’s hardware stays relevant longer than the equivalent in the PC world. With the announcement of Vista, all the reviews I have seen recommend either a new (or fairly recent) computer if you want to run the new Windows OS. How many Mac users bought a new machine to run Tiger? Quite a few, no doubt, but it should be noted that I ran Tiger just fine on a six-year-old 667Mhz laptop. Go get a six-year-old Dell and let me know how well it runs Vista. This might be old news for all you Mac vets out there, but for your brother or cousin who just bought their first Mac, be sure to pass along this useful bit of info. Macs remain competitive long after their PC brethren have gone to that great recycling heap in the sky. Which means, in the long run, your Mac cost less. Just something to think about next time you get ready to put your old Mac out to pasture. Somebody still wants it. There’s a third, arguably more applicable reason. It’s called supply and demand. There are roughly 19 PCs for every 1 Mac on the used market. That is a HUGE glut of used PCs compared to Macs, which makes the used PC market a buyer’s market compared to the seller’s market with Macs. As a consequence, used Macs retain their value more. And while this is great for sellers, it can be frustrating for those who would love to get their hands on used Macs but find themselves priced out of that market as much as they are for brand new Macs. Of course with Apple, no one is selling a new notebook for under $1100, whereas every PC manufacturer is selling $600 kit as new. It’s harder to sell used stuff, if you can get new cheaper, even in the rare instance where used is ...better equipt. I’m a troll, don’t respond to me. The part you should research is actually getting that for your Mac. My buddy recently tried to sell his MacBook Pro on eBay and was inundated with offers and a final sale price above his asking price. The problem was getting the money. Most PayPal accounts had been compromised with buyers asking him to ship it to Indonesia or some other 3rd world country. He never got his money and all the scammers outbid serious bidders. I’d say that point is arguable. For new PCs yes, but for used PCs vs used Macs, I’d say there are fewer. As Sterling points out, bargain hunters can find great prices on new PC hardware. Why buy a used laptop for $500 when you can get a brand new one for $600? Low PC prices compared to Macs undercut the used market. The other thing that makes the Apple products hold their value is that generally they hold up better than their PC counterparts. I have had some Mac’s and Apple II’s that are pushing twenty years old and still fire up. I know apple had some logic board issues with the iBooks, but for the most part they are very reliable. PC’s hold a good value for the first year you own them. Shortly after that period the values drop of FAST. You can buy 3 or 4 year old Pentium 4 machines for less than you can get a 6 or 7 year old G3 B&W Powermac. Also the demand for used Macs is pretty high too. They aren’t as abundant as used PC’s, which you can find anywhere. I would say the resell value of Apple hardware the comes down to a number of things. While information online may be free, the time spent finding the information is not. So a buyer may have decided to spend 500 “utility”, where 1 “utility” equals one dollar or one minute. This is what we do everytime we use a taxi or hire a professional, trading money for sparetime. Or opposite when we work, trading sparetime fore money. Apple have an extremly easy lineup compared to most companys and especially compared to the industry as a whole. So the consumer may spend $500 on a used Mac (assumed cost of information zero) or 100 minutes and $400 in finding a proper used PC. All numbers used is of course only for illustration. A buyer of used Apple hardware is prepared to pay a premium compared to a buyer of PC hardware because she knows that she will be able to charge a premium also when she sells the hardware. No one but Apple gains on this though. Most of the Apple lineup from 1999 and onwards have been looking good. Men crave for good-looking things, from women to clothes to cars to computers. And we’re ready to pay a premium for good looks. So even if the hardware is dated the looks remain and add value. This can be seen with the titanium/aluminium powerbook where the Al PB command a premium which can’t be fully explained by its newer technology alone. For someone wanting a Mac laptop, the least expensive start at $1100 while the least expensive pc laptop start at the $500 mark. If you can’t afford $1100 you’re forced to buy a used laptop, increasing demand and raising prices in the sub-$1000 market. PC users find this hard to believe but each Mac OS actually makes your older machine faster - I know you think this is a lie as PC users who try and install even XP2 over XP find it’s not worth the bother - just buy a new machine while I have a laptop I mostly just used to surf while watching TV or for when guests are at the house, I’ve upgraded from 10.2 to 10.4 and damn if the thing isn’t actually faster ... I know Pc users will find it hard to believe but it’s true - one reason why Macs hold up their value. Sorry, but there is no such thing as XP2. I suppose you mean XP Service Pack 2? And, you statement is completely false. I have a few friends who installed new versions of the Mac OS only to discover that their computer could not handle the additional strain. Yes, like many other operating systems, new versions MAY increase performance (Windows does this with Service Packs), REAL upgrades generally take up more resources. On another note, it IS NOT cheaper to own a Mac over the long run. If you buy an iMac and want to upgrade it later, you’re in for a rude awakening. Sure, you could sell it and buy a new one, but I could simply upgrade a PC for a fraction of the cost. In fact, I can build a system comparable to the most expensive iMac on the market for $900 less (I did this for a friend). That system will be completely upgradable in the future should he need a performance boost. Please, support Apple for the right reasons. Don’t try to make new reasons up to justify your decision. I have tried a Mac, but being a Windows XP user just made me realize how easy is to use a PC instead of a Mac. Anyways, it’s easier to find antivirus software for a PC than for a Mac. Having a computer that uses a Windows operating system is much easier to handle when you need to install new software.